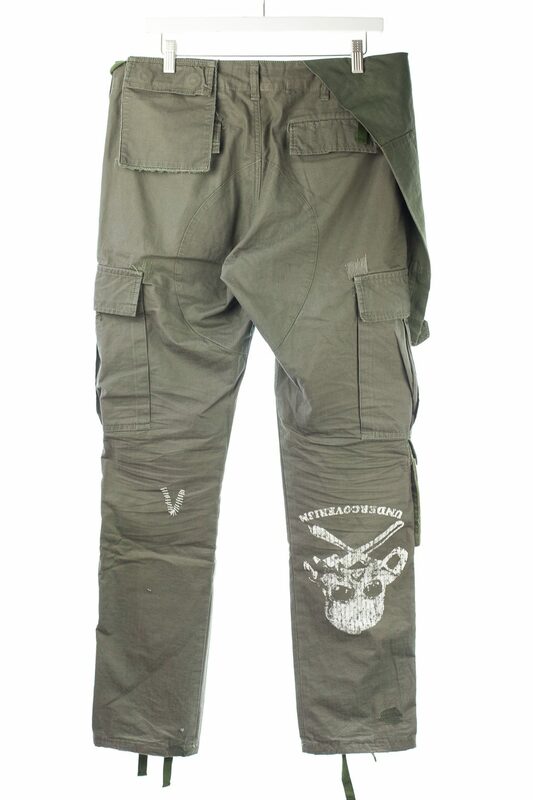 Undercover FW03 "Paperdoll" Reconstructed Military Cargos. Paperdoll is the most revisited concept in the undercover line but nothing beats the robust and thick fabric of the original collection. 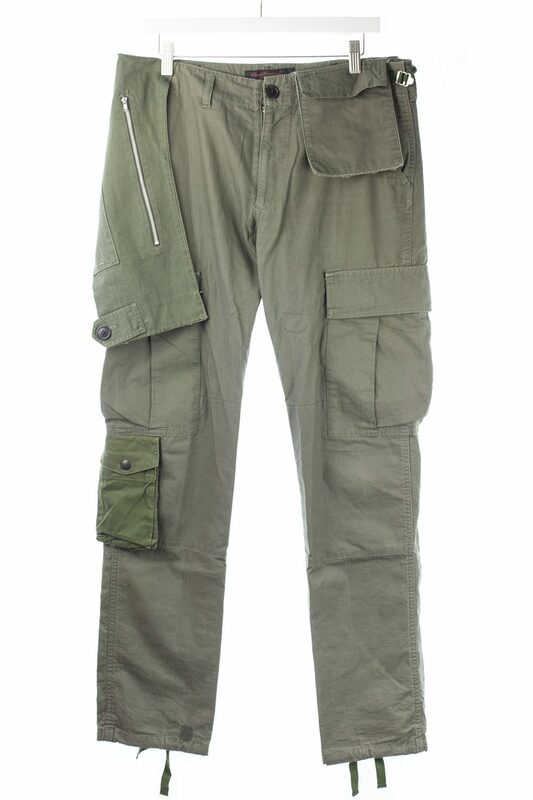 Reconstructed from military garments, these paperdoll pants sport multiple pockets, cargos and excess fabric that hang for effect. Graphic and stitching embellishments on back. 8/10 condition. Sz L fits 32. 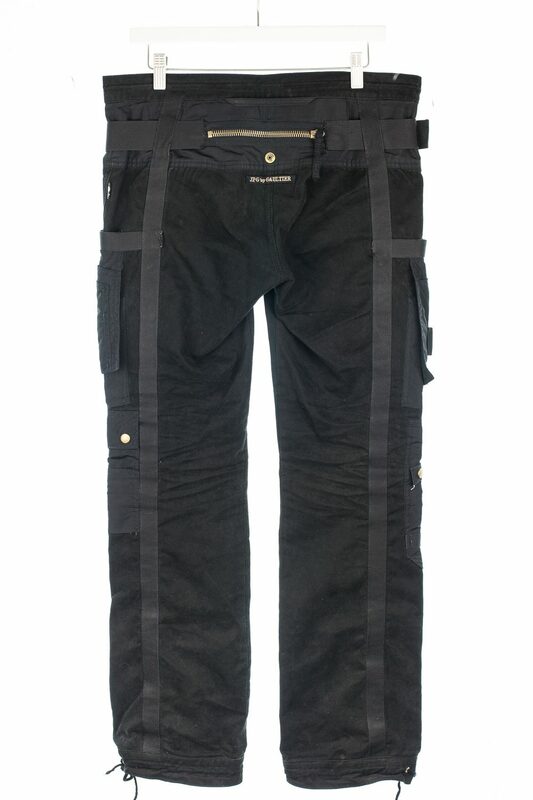 Undercover FW08 Oiled Cargos. 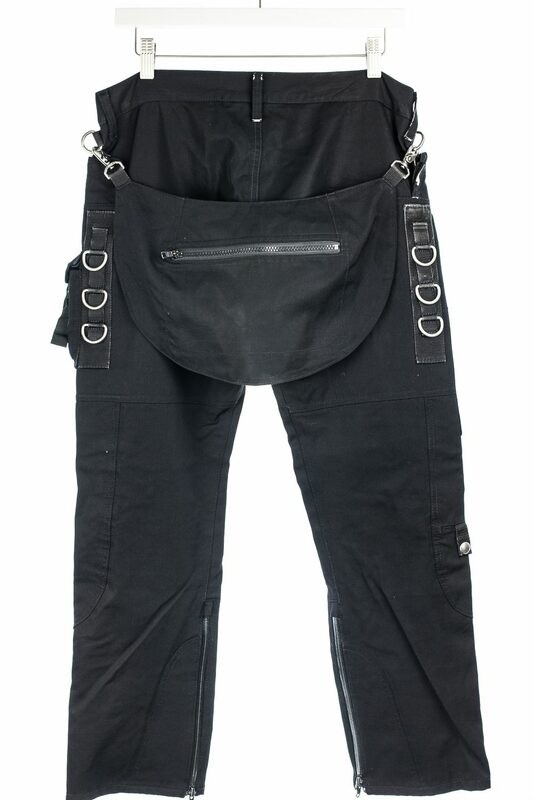 Belted waist, massive pockets and fully waxed/oiled outer. UC branding on one pocket. 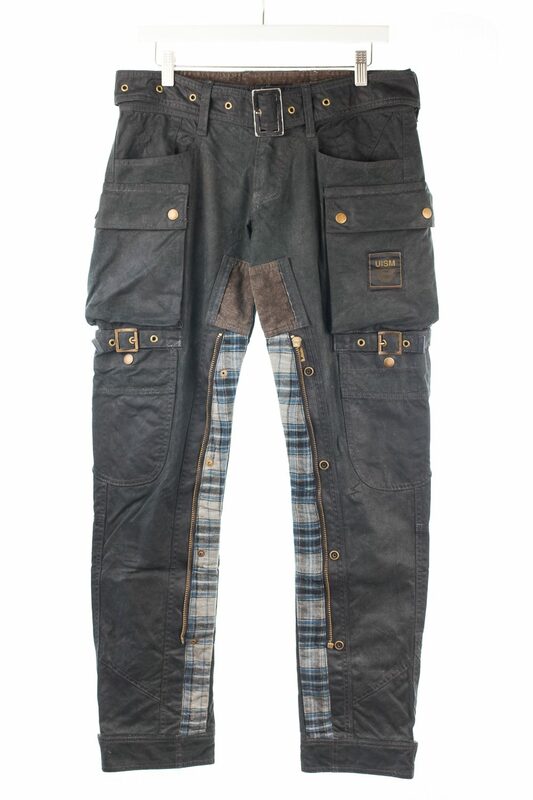 Flannel inner thigh lining with zipper embellishment. 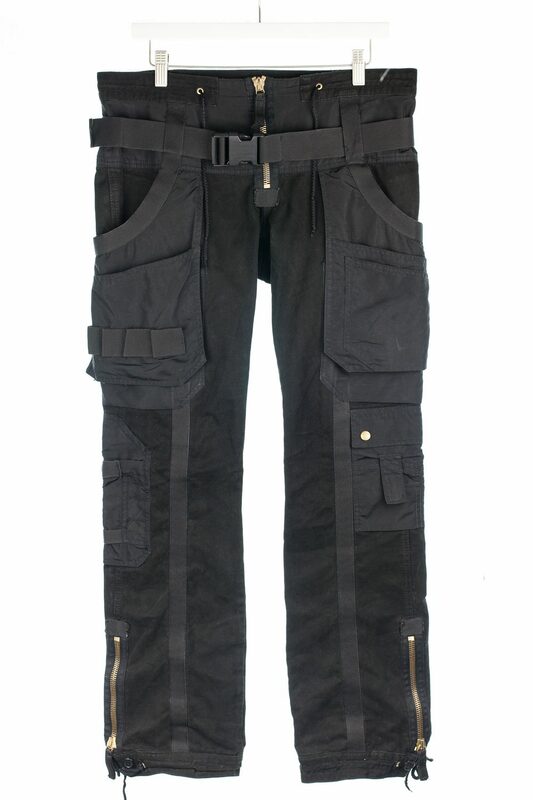 These cargos are highly sought after but fit incredibly small making large sizes rather coveted. 9/10 condition. Sz 4. 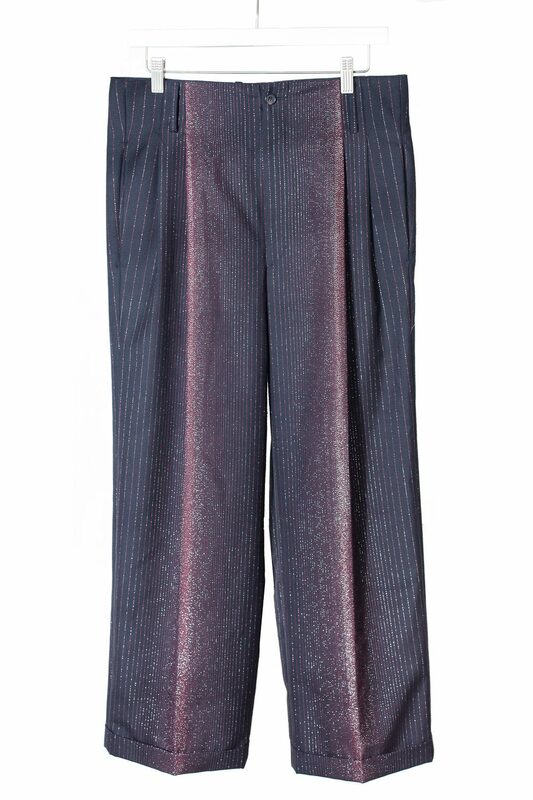 Prada FW07 Gradient Wool Trousers. Miuccia Prada sought out to explore male vulnerabilities in the sleekest way possible for this collection featuring fuzzy tops and colourful accents mixed with a familiar clean cut slim silhouette. 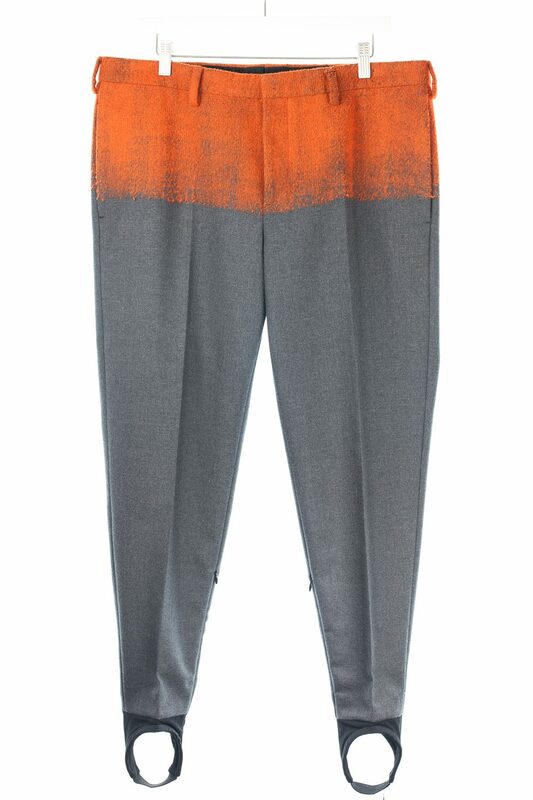 Said fuzzy fabrics were realized with cutting edge fabric technology which, for this particular piece, managed to embed the mildly broiled orange wool within the top end of the trousers. The execution is astonishing, it looks like no other gradient from other designers. 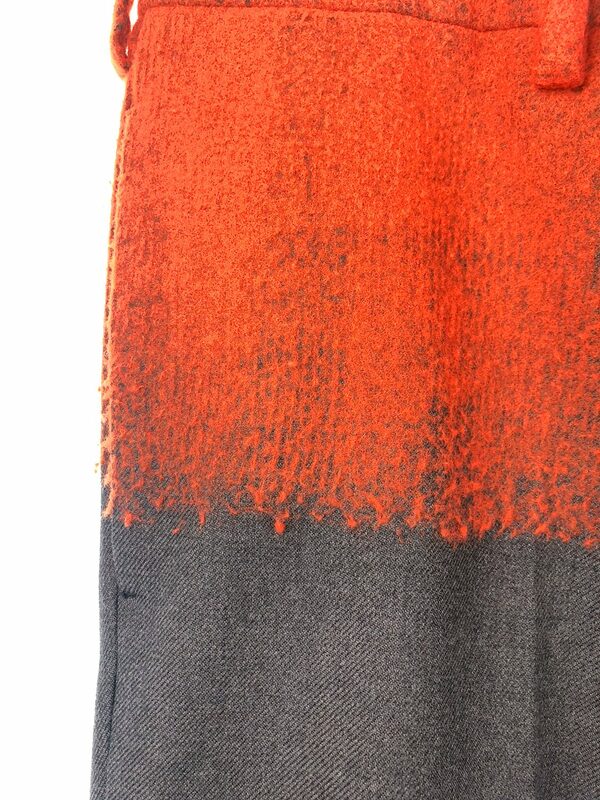 The thin layer of textured wool looks as if its smeared on the fabric. The gradient is organic and smoothly translates to the grey base. 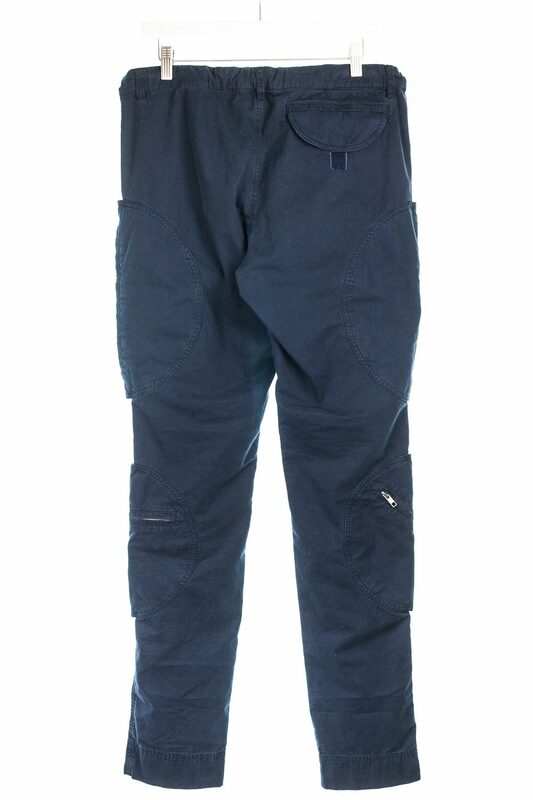 The bottom end of the trousers feature cuffs that lock under the heel which allow the wearer to not worry about "stacking", folds or a cropped hem. 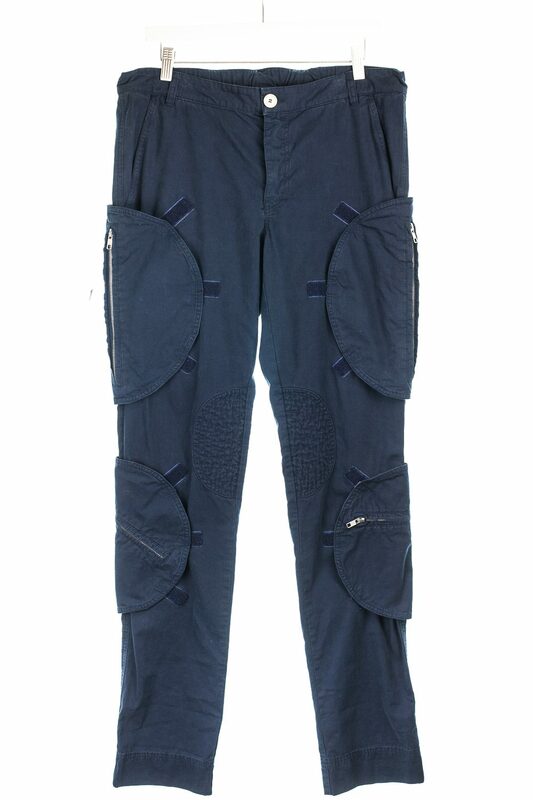 Although this discards the possibility for the wearer from hemming the pants to his desired length, it allows for an ultra-precise tailored fit for a wearer that fits the exact vanilla length. 9/10 condition. Size 52. Fits 33-34. 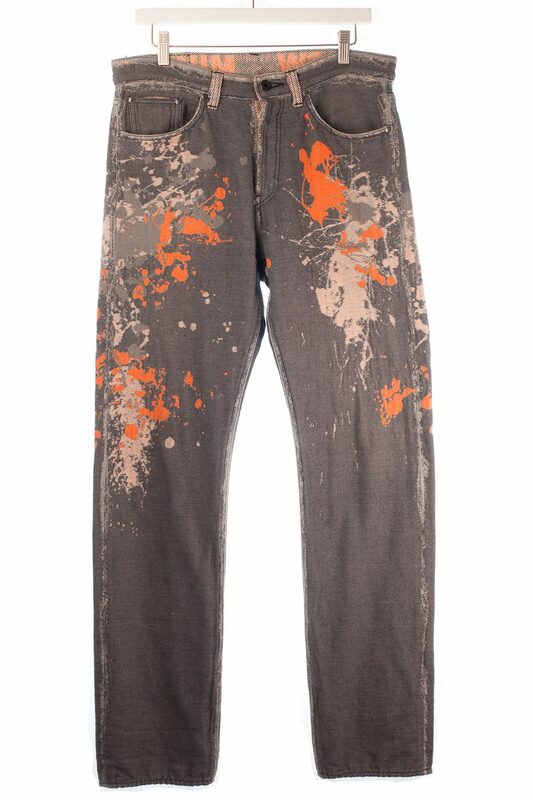 Undercover by Jun Takahashi "68" Distressed Denim. Extremely well coveted and hoarded by collectors. This is the "Navy Blue" Yarn edition which was exclusive and online sale from around ~2011, featuring a skinny cut with lower rises. 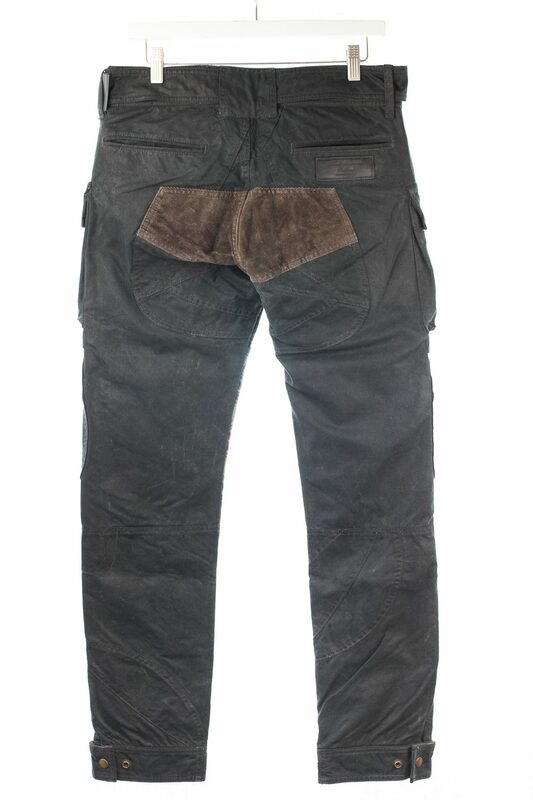 Distressing around knees, thighs and back pocket. Fades all throughout. 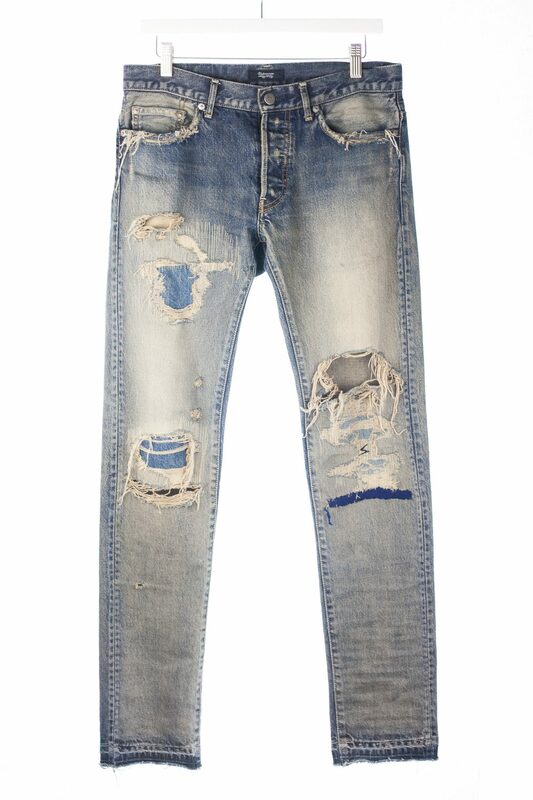 Frayed end hems, pockets and fly. Patti Smith "lightning bolt" mark on left knee. 9/10 condition. Rare Size 2, skinny fit. 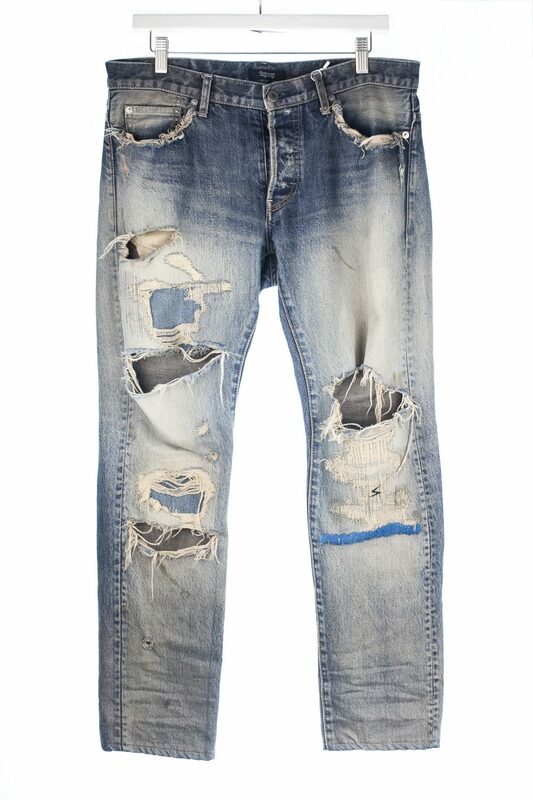 Undercover by Jun Takahashi "68" Distressed Denim. Extremely well coveted and hoarded by collectors. This is the "Light Blue" Yarn edition which was exclusive in store from 2010 or so, featuring a straight cut instead of skinny. 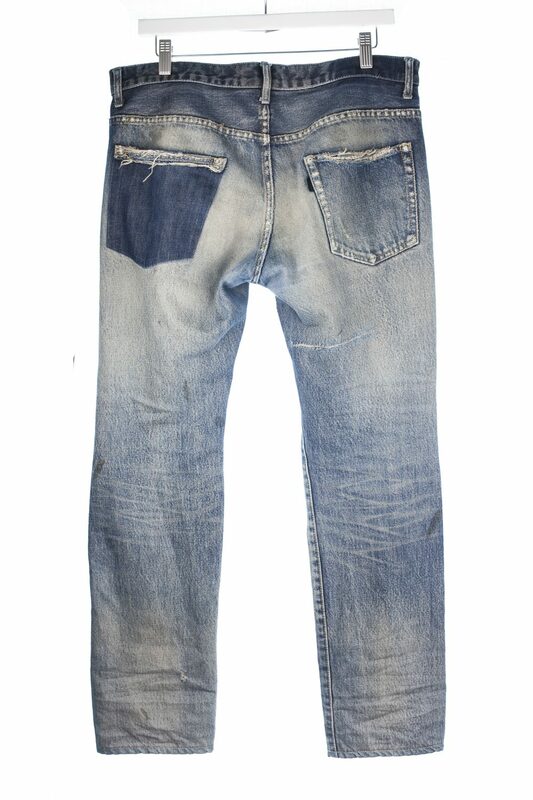 Distressing around knees, thighs and back pocket. Fades all throughout. 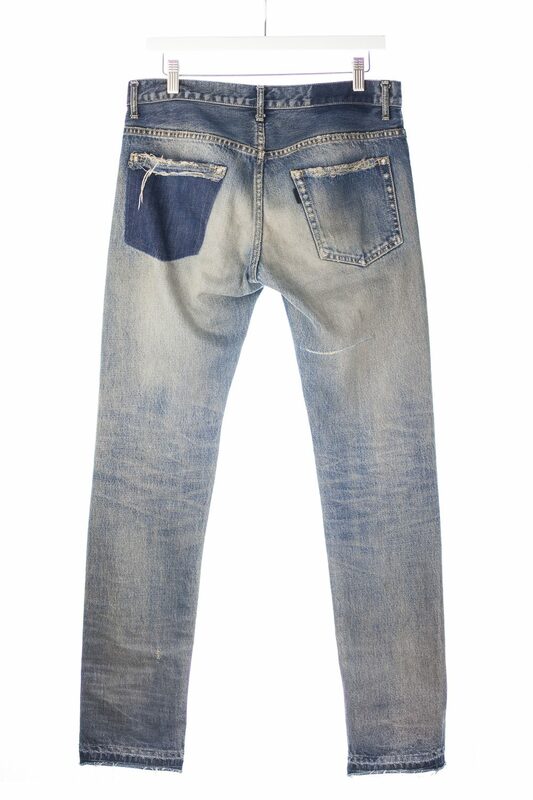 Frayed end hems, pockets and fly. Patti Smith "lightning bolt" mark on left knee. 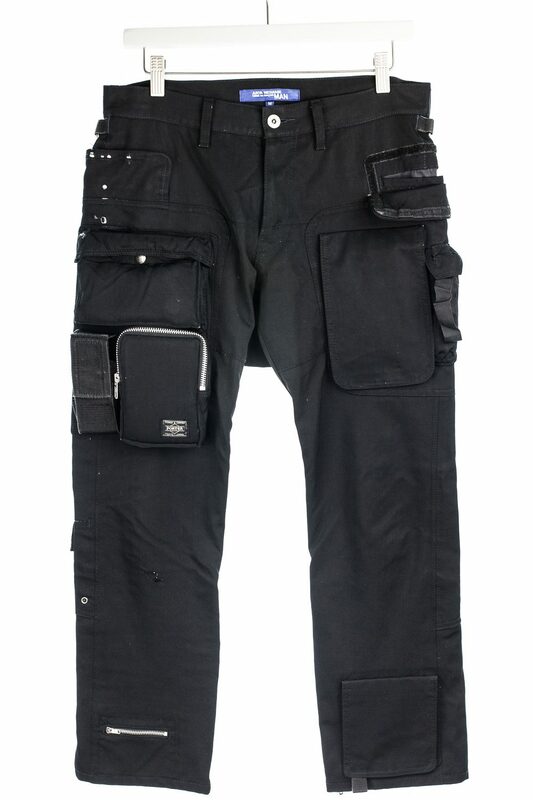 Larger sizes are much harder to find as these fit rather small. 8/10 condition. Rare Size 4.